My wife loved the scent on me. I immediately found it hauntingly familiar. The sweet vanilla was recognizable but something else in it alluded me. Many of those that have reviewed this product say it has a background of rubber. It must be the black rubber band around the bottle that suggests the smell to them because I don't agree. I know what rubber smells like; this is different. Though it does smell as if it comes from a man's environment. 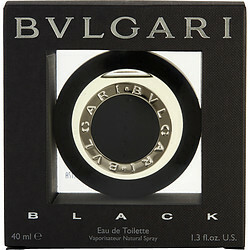 Months later I realized what the familiar scent was that Bvlgari Black kept bringing back to me. It's that of WD40 aerosol lubricant. It all makes sense now. I've heard many times that women are turned on when men build and repair things for them. When women smell this fragrance, they recollect moments when they were rewarded by a man's attention. Bulgari Black is as fabulous as ever. Wonderful scent. Woody, sensual and interesting. Love it. Might be a nice scent but it smells kind of sweet and spicy on me. Way too strong.